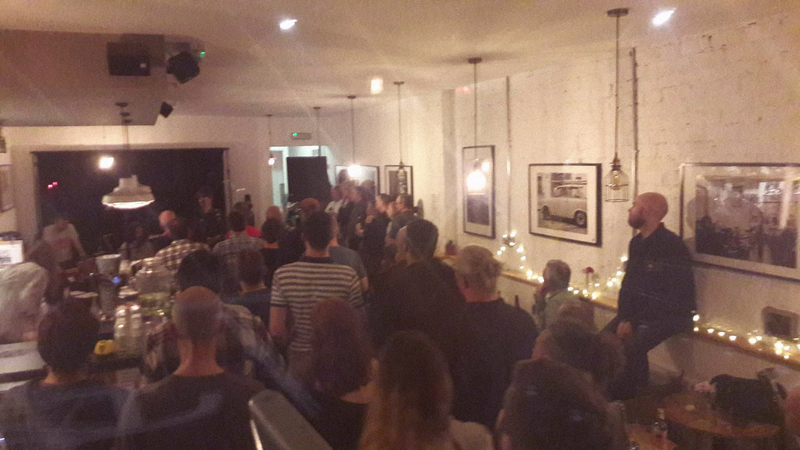 Smithdown Road played host to Americana royalty last night as Uncut-favourite John Murry brought the tour for his just-released second album to town. The rub? He didn’t bring it to town, he brought it to a little independent cafe in Wavertree. And it worked. By Alan O’Hare. There’s a vibe on Smithdown Road. Then again, there always has been. Since the likes of Kelly’s, Evil Eye, Craft Taproom, Handyman’s Warehouse and Naked Lunch started putting on gigs, though, the area has really announced itself as a place for artists to create a stir. Naked Lunch, especially, is becoming the place to go for an intimate stop-off on tour. It’s not bad for punters, either! The community-owned co-op cafe deals in leaf teas, good coffee, homemade cakes, heart-warming food and great ale… and judging by sell-outs for recent gigs during Smithdown Road Festival or for headliners such as Peter Bruntnell, customers are enjoying the music on the menu, too. Last night was a bit special. There was a full house from the start and anticipation was rising quicker than the steam on the windows. Naked Lunch is, well, intimate and there was no better place to get out of the rain last night than 431 Smithdown Road. The venue was hosting Americana icon John Murry. Murry, a favourite of the grown-up music magazines, is living in Ireland these days and has just released his second album. Reviews have been good, people are interested and the Tupelo troubadour is back on the road with a band. Naked Lunch is the smallest room they’ll be rocking, but that didn’t stop them from getting stuck in. We’ll get to that later. First up was tour support, Nadine Khouri. Discovered by John Parish (PJ Harvey), Khouri’s voice has enchanted many over the last year or so and that continued here, as her ethereal whispers washed the walls of the room. It’s funny, Naked Lunch is adorned with beautiful black and white images of European destinations and as the British-Lebanese singer pulled us in to her world, our surroundings took on different meanings. Khouri plays the guitar like it has just received the last rites and caresses its strings to locate lazy notes that brought a little Mazzy Star into the air. Those who remember Lera Lynn stealing scenes in the first season of ‘True Detective’ will find much to love here. Following the rapid eye movement sounds of Khouri was Scouser Nick Ellis. There were a few fans in and Ellis delighted many by playing some new songs from his forthcoming album, ‘Adult Fiction’. Ellis’ fever dreams captivated a sentinel crowd and he got heads nodding and toes tapping with the perpetual motion of the likes of ‘Lovers In July’ and ‘Carillion’. The new tunes were coloured a little differently musically and lyrically and whetted the appetite for the ex-Maybes man’s next move. This was the set of a musician in full control of the muse and ready to take the next step. Headliner John Murry’s steps, meanwhile, were announced by the black boots that hovered into view out of nowhere at the end of Ellis’ set and started to serenade us with Smokey Robinson’s ‘The Tracks Of My Tears’ – as starts to gigs go, it was as good as it gets. Murry brought his band to pack the tiny stage and they created a righteous racket from the off. Slide guitar mixed with Murry’s own electric solos and brought menace to even the most tender moments of his set. There are lots of tender moments in these songs. The brooding ‘Wrong Man’ was a big highlight and came on live like a long-lost outtake from ‘Automatic For The People’, while the disfigured pop of ‘One Day (You’ll Die)’ was a highlight, too. Murry is mint at the ‘disguising-the-lovely-melody-behind-a-disconcerting-noise’ thing that the best American songwriters and guitarists get away with. You know the thing, a little bit Neil Young, a little bit Nirvana and whole lot of The Repalcements. Songs come and go in between shaggy dog stories of hideous headmasters, drug runs and stolen guitars and Murry has the place in the palm of his hand for the whole set. Finishing with a wig-out version of Young’s ‘Cortez The Killer’, the room finally gives in to the wall of sound coming from the amps and drums and we’re all sent home with ears ringing, minds engaged and backs drenched with sweat. It was a perfect marriage of venue and artist, really, and a night to remind you that the city centre is not always where it’s at. As one of the original architects of Murry’s sound still sings (kind of), there’s not just darkness after the edge of town.